"Daniel didn't become a maniac overnight." 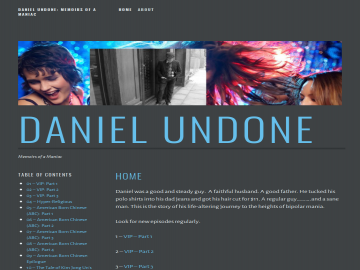 Daniel Undone - Memoirs of a Maniac has not been tagged yet. Help others find Daniel Undone - Memoirs of a Maniac by tagging it! Daniel Undone - Memoirs of a Maniac has not been reviewed yet. Daniel Undone - Memoirs of a Maniac has not been recommended yet.